MARK CLARKSON. For 6 April 1628 the parish register for St Mary Magdalene, Denton, between Canterbury and Dover, has the following entry. Entries for base-born children were common. What is unusual here is the open acknowledgement of the father. We can assume that the older Marke Clarkson was taking responsibility for his son and that the boy was brought up as Marke Clarkson. His father may be the widower Marke Clarkson, whose wife had died four years earlier. An alternative would be a son of that marriage whose baptism has not been found. We have no indication of whether young Marke was raised by his mother or in his father’s house. We know that his father did not marry Elizabeth. She went on the have another base child in 1630, this time with Richard Woodman. We then jump forward 40 years in the registers, to the baptism in 1668 of a son of Mark and Angelica Clarkson. It is possible that the Mark born out of wedlock in 1628 married and had a son Mark in the late 1640s and that it is this Mark who married Angelica. We have not found a record of such a baptism. This would require both Marks to marry around the age of 20, which is on the early side. An alternative which does not require this missing baptism is that the Mark Clarkson born in 1628 is the same Mark Clarkson who married Angelica in the 1660s. He would have been 40 when his first known child was baptised. This is older than usual, but later marriages were characteristic of the Clarksons. This would also explain why there is only one burial for Mark Clarkson in the late 17th century. This is perhaps the more convincing scenario. Mark, son of Mark and Elizabeth, would have been 14 when the Civil War broke out in 1642. London was a Parliamentarian stronghold, but Kent was largely Royalist. Charles I surrendered in 1645, but a second phase of the Civil War then broke out. In 1647 the people of Canterbury, 8 miles north of Denton, rebelled against the Puritan ban on Christmas celebrations. This revolt ended in the Battle of Maidstone in 1648. Charles I was executed in 1649. Allegiances were not always predictable, even within the same family. There was tragedy at Tappington Hall in Denton. ANGELICA. No record has been found of their marriage, so we do not know Angelica’s surname or former parish. Since their first child was baptised in 1668 it is possible that she was younger than Mark, possibly born in the 1640s. On the other hand, she could be an older woman, possibly a widow. Mark and Angelica seem to have married in the late 1660s, after the Restoration of the monarchy under Charles II. The first record we encounter of them is the baptism at St John the Baptist, Barham, of a child for Mark and Angell Clarkson on 30 July 1668. True to the tradition in this family, the child was named Mark. 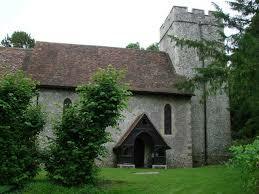 Soon after that the family moved two miles south to Denton, or began to use that parish church. We then have the burial of two children in Denton: for Mary, daughter of Mark Clarkson, on 23 May 1669, and Mark, son of Mark Clarkson, on 13 July that year. Their deaths may be connected. This is five years after the Great Plague of London. Outbreaks occurred in many other places around this time. Or it may have been some other infectious illness for which treatment was not available then. The Clarksons went on to have three more children. All were baptised at the parish church of St Mary Magdalen, Denton. Among them was a second Mark. In the Barham register the mother’s name is given as Angell. In Denton she was Angelica for all three baptisms. We then have a burial in Denton on 2 Jan 1684 for Mark Clarkson. The base-born son of 1628 would have been 56. On the same day was buried “a poor labourer”. Presumably he had come to the parish alone, and no one knew his name. Angelica survived him by four years. On 19 Nov 1688 we have the burial in Denton of Angelica (widdow) Clarkson. Their son John may be the John Clarkson who married Mary Hudson at Nonington in 1696. A John and Mary Clarkson had children baptised in Womenswold, adjacent to Barham and Denton, including a son Mark. 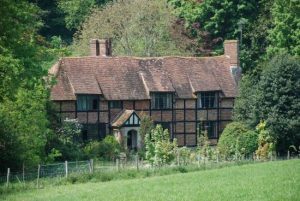 Mark, son of Mark and Angelica, settled in the Clarksons’ early home in Barham and married Bennet Page. In 1699 Mary Clarkson married Richard Hogben in Barham.